ESR | July 21, 2003 | Can Dean take the heat? Can Dean take the heat? Vermont's best-known product is one that simply cannot take the heat. Buy a Ben and Jerry's ice cream cone, place it in the glare of the hot summer sun and it will melt away. But Vermont has a new product that is coming on so fast, it's worth asking: can this popular product really take the heat? 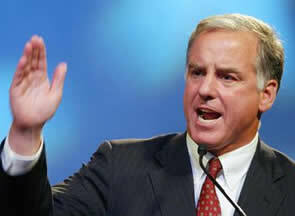 The product is Howard Dean, a candidate attractively packaged for liberals as their great hope to win the White House. Dean presents himself as the spiritual heir to the late Paul Wellstone, an unswerving liberal stalwart who was unafraid to take bold stands. He generated headlines and donations and volunteers by daring to challenge the Iraq war. He proudly proclaims in speeches to liberals across the country that he represents the "Democrat wing of the Democratic Party." But Dean also presents himself as "reasonable" on select issues important to conservatives to help give him the appearance of being more of a centrist. Conservatives and right-thinking independents should not be fooled, however, by the misleading rhetoric coming from Dean. political consensus than his personal wishes. Ask NRA members how they would grade his position on gun issues as a presidential candidate. The 1994 ban on semi-automatic weapons, which, as the NRA points out, became redefined by Congress as assault weapons, is one law that Dean would like to see kept on the books. It expires September 13, 2004. Right there, that should tip off conservatives where Dean's true sympathies lie. As The Washington Post editorialized in 1994: "Assault weapons play a part in only a small percentage of crime. The provision is mainly symbolic; its virtue will be if it turns out to be, as hoped, a stepping stone to broader gun control." Dean deserves to be pressed on whether he truly wants to just maintain the 1994 assault weapons ban or whether he would back one of two bills that purport to extend the ban but do much more. Rep. Carolyn McCarthy (D-NY) has introduced H.R. 2038 which would not only reauthorize the ban, but it would encompass many more guns, including those that are rarely used to commit crimes. By requiring manufacturers to name their dealers and dealers to name the stock they carry, national gun registration is being ushered in through the backdoor. Nor is there a 10 year sunset clause. Or does Dean support the less far-reaching S. 1034 bill introduced by Senators Dianne Feinstein (D-CA) and Charles Schumer (D-NY) that nonetheless permanently bans many guns, including popular target rifles. This, too, does not include a sunset clause. Even if he supports keeping the current assault weapons ban as written on the books, the fact is that even the 1997 congressionally mandated study by the liberal Urban Institute, has conceded: "At best, the assault weapons ban can only have a limited effect on total gun murders, because the banned weapons and magazines were never involve in more than a modest fraction of all gun murders." Dean is clearly no straight shooter when it comes to gun issues. Nor could a Dean Administration liberal-staffed Justice Department be trusted to place the rights of gun owners first. Then, there's his proclaimed support for a balanced budget, which no doubt could lead unsuspecting voters to think he supports restrained spending policies. I feel very strongly about balanced budgets," he told The Nation in March 2003, only to soon add that "at the federal level you can't slavishly adhere to a balanced budget at all times." Indeed, a Dean Administration may not have much deep-seated devotion to a balanced federal budget at all given that he is calling for a "universal" health insurance program that would extend Medicaid and State Children's Health Insurance Program coverage to all lower-and middle-income children and young adults under age 25. He also wants to cover adults earning as much as 185 per cent of the poverty level. The money would come, for this and more in his plan, from rolling back the Bush tax cuts. Now, Dean did balance his state's budgets and resisted calls from the state's left for taxing his state's well-to-do citizens. Indeed, he actually cut his state's income taxes four years ago. Yet, conservative columnist John McClaughry wrote in The Rutland Herald on December 18, 2002 that Dean needed to fess up and tell just how he managed to balance his state's budget during his last year in office. It was by "robbing other funds, increasing local share property taxes, and levying an unlegislated tax on health insurance paid by individuals, small businesses, and self-insured companies." The Cato Institute in its 2002 fiscal report card on the nation's governors stated that Dean was very much an activist governor who backed "state-funded universal health care, government-subsidized child care (even for upper-income families), a higher minimum wage, liberal family leave legislation, and taxpayer-financed campaigns." Is it any surprise that Cato's Stephen Moore and Stephen Slivinski would conclude that "After 12 years of Dean's so-called 'fiscal conservatism,' Vermont remains one of the highest taxing and spending states." Conservatives should have none of this. Dean, at heart, is not pro-2nd Amendment, nor does he believe in a limited federal government that places equal value on low taxes and low domestic spending. His support for legalized abortion and homosexual civil unions indicates that he is in line with the lobbies whose radical, left-wing agenda have undermined the traditional family and its values. As a skillful politician, Dean may be able to finesse the dissonance between what he says and the actual truth. So far, he appears to be more a scandal-less Bill Clinton than Harry Truman when it comes to offering the voters straight talk on issues. My wager is that, should Dean obtain his party's presidential nomination, conservative groups will need to be aggressive and accurate in exposing his record to the harsh, unrelenting glare of the truth. But if they do it right, his support will melt faster than a Ben and Jerry's ice cream cone in Death Valley.